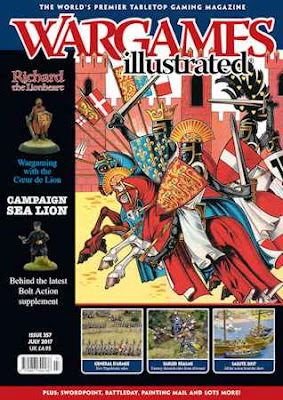 Our theme for WI357 is Richard the Lionheart, and we present four articles that feature Wargaming with King Richard the First of England. Including a report from the Society of Ancients' Battleday, which featured eleven different games playing the same battle: Arsuf 1197. More products that have caught our eye, including our ‘Spotted at…’ show feature, connected to Salute this time and with items from other sources to boot. How did Richard I become the king known as the Lionheart? Neil Smith and Dom Sore provide some history and a game scenario taken from Richard’s early life. Looking for a new mass battle game that covers Ancients down to the early Renaissance? Then this could be the game for you. Do you know your coifs from your ventails? How’s your surcoat? And where can you get the ‘right’ Richard I era miniatures from? We provide a useful guide to this and much more. Just how do you go about ‘bending’ history to create a whole new aspect of World War Two? John Lambshead tells us how he did it, the Bolt Action way. It was what everyone was waiting for during the Third Crusade, Richard I versus Saladin in 1191, a battle that would go down in history…. Ever wanted to create your own armoured train? After something special to add to your Czech Legion forces? Then this is where to start your journey. One battle, eight separate games, eight different sets of rules. This year’s SoA Battleday took the Battle of Arsuf as its theme and we took the battle as our theme (or part of at least). Our annual report on the UK’s largest one-day wargames show. Simon Bradley of Stone Cold Lead shares his method for painting chainmail armour. Nick Buxey charts the journey from handmade ‘master’ to final production model of an ACW Ironclad. Masters of creating great looking games, the duo behind Victorian Steel tell us all about their award winning Boxer Rebellion game as presented at the Hammerhead show earlier this year. We take a look at this forthcoming set of fantasy themed skirmish rules from the team behind the 4Ground company. An insight into these Napoleonic Era rules from the Reisswitz Press. Nick Eyre may work in ‘the hobby’ but he stills takes time to enjoy ‘his hobby’. We feature this West London based club and its own take on gamer inclusion.